On the evening of 12 November 2015, Sky Sports News F1 expert Tony Jardine and World Champion co-driver Gordon Noble rolled over the ceremonial ramp on a blustery Llandudno seafront that indicated the start of Wales Rally GB, the longest and most challenging event on the British rally calendar. The first special stages of the rally, which will see more than 160 cars travelling flat out through the forests of North and Mid-Wales, begin tomorrow at Hafren, which is also the longest special stage on the rally, before continuing throughout Friday and into the weekend, ending up back at the Service Park in Deeside on Sunday afternoon after the cars have covered more than 1500 kilometres. On the way, the ProSpeed team’s PlayStation®4 and Lockton MIS Motorsport backed Mitsubishi Evo IX will have to face deep mud and slippery conditions, likely to be only made worse, with Storm Abigail due to batter the North Wales coast at the weekend. The team’s progress through these treacherous conditions will be followed by PistonHeads.com, who will be updating a blog from the team throughout the weekend. Jardine and Noble are both well aware of the conditions that Wales Rally GB can throw at them, with Jardine taking part in his 22nd Rally GB event, the same number as 1983 World Champion Hannu Mikkola, as well as growing up on the Wirral, just a stone’s throw from the service park in Deeside. Noble meanwhile was a class winner at the rally last year, finishing top of the JWRC class alongside Alastair Fisher. 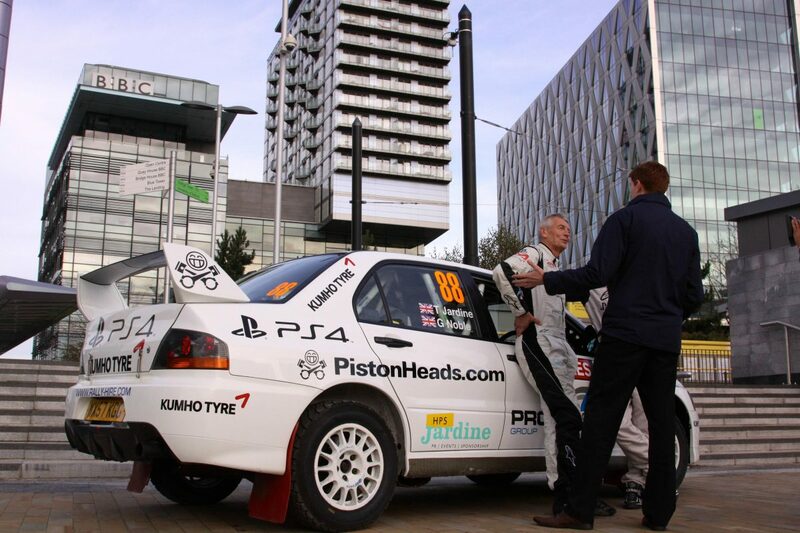 Ahead of the rally start, media duties were a priority for Jardine and Noble, who were given the opportunity to visit ITV Granada at Media City in Salford to talk about their involvement in Britain’s round of the World Rally Championship as well as speaking at a pre-event rally forum, where the pairing shared the stage with reigning FIA World Rally Champion Sebastien Ogier and former World Rally Champion and current FIA World Rallycross Champion Petter Solberg. Also in attendance was former British champion Jimmy McRae, father of the late-great Colin McRae to whom the rally is dedicated on the 20th anniversary of his World Championship triumph.